There are Mystery Cults beyond the four Mystery Houses within the Order of Hermes. They keep their secrets hidden from other magi, revealing their knowledge piece by precious piece, and only to those who undergo their grueling ordeals. This book reveals all, from alchemists seeking immortality to theurgists trying to become gods. 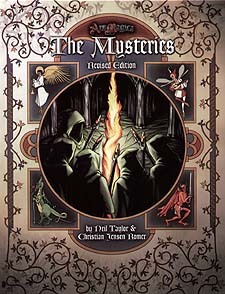 It describes secret cults' lore, organization, and initiation rites, includes new Virtues, Flaws, and Abilities, presents dozens of new spells, and introduces detailed new systems for joining Mystery Cults and progressing through their degrees of initiation. Now your magus, too, can walk the paths of The Mysteries.